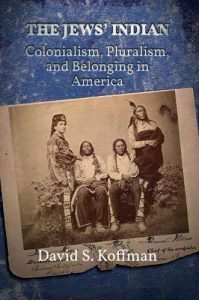 I am delighted to report that David Koffman's much anticipated book, The Jews' Indian: Colonialism, Pluralism and Belonging in America (Rutgers), is now out. Below please find a summery and table of contents. Please join me in congratulating our colleague on this great achievement. Read the full YFile Article here. The Jews’ Indian investigates the his tory of American Jewish relationships with Native Americans, both in the realm of cultural imagination and in face-to-face encounters. These two groups’ exchanges were numerous and diverse, proving at times harmonious when Jews’ and Natives people’s economic and social interests aligned, but discordant and fraught at other times. American Jews could be as exploitative of Native cultural, social, and political issues as other American settlers, and historian David Koffman argues that these interactions both unsettle and historicize the often triumphant consensus history of American Jewish life. Focusing on the ways Jewish class mobility and civic belonging were wrapped up in the dynamics of power and myth making that so severely impacted Native Americans, this books is provocative and timely, the first history to critically analyze Jewish participation in, and Jews’ grappling with the legacies of Native American history and the colonial project upon which America rests.